In our current season of Eldritch Sigils the investigators finally made a premeditated choice to breach the Veil and step to another dimension. We have been playing this campaign since 2011 (or 2010?) and this was the first time the players weren’t forced to do it. And that got me thinking about different dimensions and how to present them. I have discussed travelling through time in an earlier post from 2015 and while time is a dimension itself and many of those same ideas could have been used I wanted something different. Biggest lesson from last few years of gaming to me might have been that I can accept the fact that not all campaigns will work. At first this seems like no-brainer. But only after some consideration, failures, and successes was I able to embrace this. It is not “letting your players down” nor is it “failing”. Understanding your own resources as GM is a tool. So in this post I will try to explain this personal notion. Sandbox campaigns are a dream I have chased for years. A campaign where the players participate in the story, create memorable content and I act only as a referee. I know that many people chase the same white rabbit and I’m going to discuss my methods of catching it. We finished our latest season of Eldritch Sigils just last night. It was one of the most epic season with game starting in 2099 and ending in 1770s after a detour in about 2300. When we started this campaign exactly ten months ago I had no idea where the story would take us. I was once again trying to force my players to play with me on my sandbox. New season for Eldritch Sigils is on. This time we will play in the end of the 22nd century where the PCs are member of the organisation trying to keep the reality from shattering. It’s less than hundred years from “now” but Cyberpunk (as a time and style) is still a thing in the past and that means some changes in the way things work. And during the first session we had an interesting conversation about transhumanism. 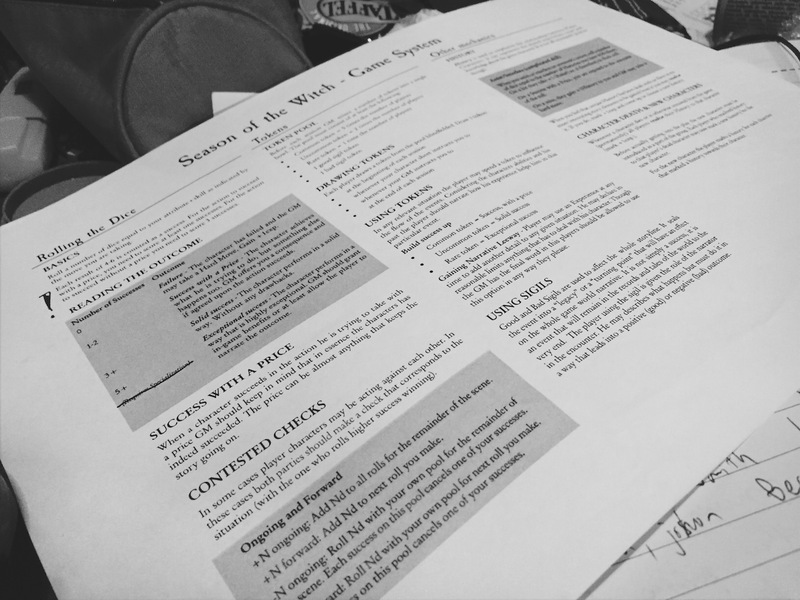 Last week we played the long anticipated tenth session of our last “season” of Eldritch Sigils called The Season of the Witch. Rather than being (all) about the last session I try once again debate about ending a campaign. At the start of this campaign we established that the characters were chosen by George Washington to uncover a diabolic cult of witches that had been plaguing the New World since its founding. As with most campaigns it all went to hell but this time with an intended bang. Though it seems we have more than enough of timing issues with this campaign we are managed to have an awesome fourth session yesterday. And even though we have been using Eldritch Sigils for a few years for the campaign it seems we can still find minor details that need correcting. It seems like ages ago when I was GMing ANKH to my friends after school and just had to tweak the rules of the game to suit my taste. It might have been twenty years ago but I’m still doing it. And for the life of me I cannot see the reason why? Why cannot I be satisfied with the rules as written? It took us some time to get back to this (well, actually about two months) but finally returned to colonial America. Since I’m already writing a campaign debrief on this forum I decided that we do not really need another one. Thus this post is mostly about stealing stuff from other games to improve your own. As roleplaying games go our “Sins of our Fathers” campaign is the longest I have ever participated in. Last Tuesday we started “the sixth season” and this time the action takes place in colonial America right after the raid on Joseph Curwen’s farm in 1772. As with the previous seasons we will use the refined version of my Eldritch Sigils game system that relies heavily on the AWengine.